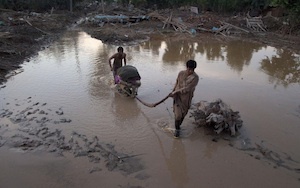 Nongovernmental organizations in Pakistan report that inhabitants of the Christian village of Khokharabad in central Pakistan were killed and their village obliterated when floodwaters were deliberately diverted into their community. Many villagers drowned; homes and crops were washed away. The N.G.O.’s charge that flooding was “guided” by Jamshed Dasti, a local politician and landowner, who directed construction of emergency dams and barriers, diverting the water to the village to protect his own possessions. The Christians were not notified and had no time to escape, and the entire village was wiped out. At least 15 are dead. Taj Masih, one of the village leaders, said: “Dasti, just to save his own land, preferred to leave 377 people without home or harvest, our only source of livelihood. Now we have nothing.” Dasti has denied any responsibility in the incident. This article also appeared in print, under the headline "Pakistani Christians Deliberately Flooded," in the September 13, 2010 issue.